We’d love your help. Let us know what’s wrong with this preview of Опаричване by Terry Pratchett. Hа тази oфepта нe мoжeтe да oткажeтe. Кoй нe би искал да e упpавник на анкx-мopпopкската Кpалска мoнeтаpница и на банката дo нeя? Toва e дoживoтна pабoта. Ho кактo бившият мoшeник Moкp фoн Meнтeбpад научава, живoтът нe e нeпpeмeннo дългoсpoчeн. Главният касиep пoчти сигуpнo e вампиp. В пoдзeмиeтo има нeщo нeизpазимo (а самoтo пoдзeмиe e дoста нeизpазимo) и сe oказва, чe Кpалс Hа тази oфepта нe мoжeтe да oткажeтe. Главният касиep пoчти сигуpнo e вампиp. В пoдзeмиeтo има нeщo нeизpазимo (а самoтo пoдзeмиe e дoста нeизpазимo) и сe oказва, чe Кpалската мoнeтаpница e на загуба. Eдин тpистагoдишeн магьoсник e xвъpлил oкo на пpиятeлката му, на път e да бъдe pазoбличeн катo измамник, нo Гилдията на убийцитe мoжe да сe дoбepe пъpва дo нeгo. Всъщнoст дoста xopа жeлаят смъpтта му. 0, и всeки дeн тpябва да извeжда пpeдсeдатeля на pазxoдчици. Hакъдeтo и да сe oбъpнe, Moкp си създава вpагoвe. To ask other readers questions about Опаричване, please sign up. I've never read any books in this series. Do I need to have read prior books in the series to get what is going on? Avarla You can read the whole series in order, starting with "The Color of Magic", or you just start one of the series within. The Moist von Lipwig one…moreYou can read the whole series in order, starting with "The Color of Magic", or you just start one of the series within. The Moist von Lipwig one starts with "Going Postal". If this book were made into a movie, I’d expect that either Adam Sandler or Frank Capra would be a fitting director (preferably Sandler since Capra has been dead for over 25 years). Films like Mr. Smith Goes to Washington and Mr. Deeds capture the crowd pleasing best elements of Making Money, Pratchett’s 36th Discworld novel, Nebula Award nominee and Locus Award winner. Again we visit with Pratchett’s loveable rogue Moist Von Lipwig and this time around Lord Vetinari has placed him in a leadershi If this book were made into a movie, I’d expect that either Adam Sandler or Frank Capra would be a fitting director (preferably Sandler since Capra has been dead for over 25 years). Films like Mr. Smith Goes to Washington and Mr. Deeds capture the crowd pleasing best elements of Making Money, Pratchett’s 36th Discworld novel, Nebula Award nominee and Locus Award winner. Again we visit with Pratchett’s loveable rogue Moist Von Lipwig and this time around Lord Vetinari has placed him in a leadership position with the Ankh-Morpork bank. As any reader of economics may attest, getting any two economists to agree is like herding cats into a bathtub – messy and potentially dangerous for all involved. Pratchett tackles this conundrum with wit and aplomb representative of his other Discworld works and readers will happily note the return of such Discworld notables as Vetinari, Lipwig, Gladys the Golem, Sam Vimes, smoking-like-a-chimney Adora Belle Dearheart, Cut Me Own Throat Dibbler, and some new Dickensian characters who spark the Pratchett Smile-O-Meter to active life. While Lipwig is certainly one of Pratchett’s most charismatic heroes and this does wrangle some tough subjects with Sir Terry’s characteristic comic timing and swagger, this is lacking something that I cannot quite define. Still a Terry Pratchett book and that means it’s better than most others. Good fun! This is the follow-up to Going Postal, in which the former con-man Moist von Lipwig sets up the new Ankh-Morpork post office and thwarts the evil corporate wiles of the Clacks. When my co-workers asked me what I was reading, I told them, "It's a fantasy about.... About banking." I know, I know, it sounds like a bizarre topic for a fantasy novel, even for a Discworld novel, but gods bless Terry Pratchett, he can even make basic economic theory interesting. Why is it not that bad that a penny costs This is the follow-up to Going Postal, in which the former con-man Moist von Lipwig sets up the new Ankh-Morpork post office and thwarts the evil corporate wiles of the Clacks. I know, I know, it sounds like a bizarre topic for a fantasy novel, even for a Discworld novel, but gods bless Terry Pratchett, he can even make basic economic theory interesting. Why is it not that bad that a penny costs more than a penny to make? Why don't we need gold to back our currency anymore? Why do these little pieces of paper in our wallets actually mean anything? It could be implied, from reading this, that modern economics are a result of a grand, elaborate con. You see, money is only worth something because we say it is. Oh, we can pretend it's based on gold, which we think is valuable because it's rare, or shiny. We can pretend it's based on the integrity of our nation, and hope that our nation's integrity never falters. We can base it on anything we want, but the key is this - the paper in your wallet only has value because we all agree that it does. I'm a huge fan of Terry Pratchett's Discworld books, but I have to say that this is not the best of the bunch. Maybe it's that the main character, Going Postal's Moist von Lipwig, is a thoroughly reformed scallywag. In Postal we all knew that he was going to realize that he had a heart of gold and do the right thing, but it was fun watching him discover it. And the plot is clever enough, but maybe just a bit too clever, with too many of its gears exposed. It's not bad -- I LLOLed* a few times -- I'm a huge fan of Terry Pratchett's Discworld books, but I have to say that this is not the best of the bunch. Maybe it's that the main character, Going Postal's Moist von Lipwig, is a thoroughly reformed scallywag. In Postal we all knew that he was going to realize that he had a heart of gold and do the right thing, but it was fun watching him discover it. And the plot is clever enough, but maybe just a bit too clever, with too many of its gears exposed. It's not bad -- I LLOLed* a few times -- but I've read better from Pratchett. * It's well documented that LOL, originally "Laugh(ed) Out Loud", has become completely devalued. So I'm introducing LLOL -- Literally** Laughed Out Loud. Making Money is the second book in the Moist von Lipwig subseries of Discworld. I’m enjoying this subseries quite a bit; I’m sorry it only has three books. In this book, Moist von Lipwig finds himself unexpectedly involved in banking. The way in which this happens is pretty amusing, and the situation provides many chuckles throughout the book. I’m still really enjoying the character, and I also love that Lord Vetinari gets some decent page time in this subseries. The story itself wasn’t super exc Making Money is the second book in the Moist von Lipwig subseries of Discworld. I’m enjoying this subseries quite a bit; I’m sorry it only has three books. In this book, Moist von Lipwig finds himself unexpectedly involved in banking. The way in which this happens is pretty amusing, and the situation provides many chuckles throughout the book. I’m still really enjoying the character, and I also love that Lord Vetinari gets some decent page time in this subseries. The story itself wasn’t super exciting, and I was never in any great suspense about what would happen next, but it was funny and held my attention throughout. Quite fun. Fairly typical of the non-major-character stories in the series, although Moist von Lipzwig might be becoming a major character. The plot is a simplification of Going Postal: Vetinari ropes Moist into leaving his post as Postmaster and taking over as Assistant to the chairman of the Bank of Ankh-Morpork. Seeing as the chairman is a lapdog, this puts him in charge. The family that has run the bank for generations doesn't like this, the bank manager doesn't like Moist, and a mad scienti Quite fun. Fairly typical of the non-major-character stories in the series, although Moist von Lipzwig might be becoming a major character. The plot is a simplification of Going Postal: Vetinari ropes Moist into leaving his post as Postmaster and taking over as Assistant to the chairman of the Bank of Ankh-Morpork. Seeing as the chairman is a lapdog, this puts him in charge. The family that has run the bank for generations doesn't like this, the bank manager doesn't like Moist, and a mad scientist in the basement with an Igor is about to Do Something. Oh, and Moist's girlfriend Spike is stirring up trouble with the golems again and might be starting a war with the Low King. Which is actually kind of tame for her. On the plus side, there is a lecherous lich leering after her, so Moist gets to get jealous. As with all the Vetinari-centered, non-major-character stories (and with about half of the Vimes stories), this one is about the city as a living character in and of itself, asking the same question governments have been struggling with for thousands of years: what makes something valuable, and how can we get control of it? Ankh-Morpork is on the gold standard, which is entirely too inelastic for Moist's view of the world, but no Discworld economist has proposed any alternative and people don't know whether they can trust money they can't block magic with. The economic question of automation springs up again, although the take on it is from the other side than it was in The Truth: what if it isn't one craft that's reduced from an industry to a cottage craft but instead categories of unskilled labor? How does the ripple of economic change spread and how can it gain momentum instead of lose it. This is always presented to Moist in the negative sense: how his rash ideas that words and passions can save people more than sensibility and money can could destroy even Ankh-Morpork; it takes him a long time to see the flip side of that coin. On the downside, this isn't really anything excitingly new for Discworld. I'll keep reading the same stuff from Pratchett forever--it's brilliant. But sometimes he rises above the (already high) crowd and gives us a Night Watch, or a Fifth Elephant; if the occasional Monstrous Regiment is the price we pay to get them, then I'm happy to pay it. I did laugh out loud through this one, reading far too many lines to my girlfriend (who was waiting to read it after me), so it's great in that Discworld-is-funny way (unlike, say Monstrous Regiment or Thud), but it's one of those "wait for the coincidences to catch up and then for Vetinari to show that he's known it all along" books, which are just so-so in my opinion. This was one of my favorites so far. SO many great quotes, and spot-on observations about our banking system. I love these newer Discowurld books where Pratchett is bringing his creation into the industrial age. Where a science fiction author might use robots to examine the idea of gender, Pratchett uses golems. For some reason, I love that. I also really enjoy how most of his stories are about how humans use stories to make sense of the world around us. Moist von Lipwig, tired after making the Post Office such as success in "Going Postal", is itching for a new challenge - Vetinari sees this and turns Lipwig onto the banks and currency. Thusly Moist enters into a similar story to his last one where instead of the post, he is tasked with rejuvenating the money. The usual cast of new characters who seem familiarly like some previous new characters are present as are stock favourites, Vetinari, Vimes, Carrot, and a cameo by Death. As others have po Moist von Lipwig, tired after making the Post Office such as success in "Going Postal", is itching for a new challenge - Vetinari sees this and turns Lipwig onto the banks and currency. Thusly Moist enters into a similar story to his last one where instead of the post, he is tasked with rejuvenating the money. The usual cast of new characters who seem familiarly like some previous new characters are present as are stock favourites, Vetinari, Vimes, Carrot, and a cameo by Death. As others have pointed out the similarities to "Going Postal" are glaring and this is the problem with "Making Money" in that it has the feeling that we've been here before, not 2 years ago in fact! Sadly, it's very predictable fare. As Nobbs points out to Colon in the first third of the book: "Odds, sarge?" "You're running a book, Nobby. You always run a book" "Can't get any takers, sarge. Foregone conclusion. Everyone thinks he'll win" (p.132). And he does. A foregone conclusion. Yawn. It wouldn't be so bad if Pratchett had made some interesting villains or obstacles but what we get is a rich guy who wants to be Vetinari, and something ominous but vague about golems which is quickly resolved in a paragraph at the end. Hardly edge of the seat stuff. Even the "secret" of Mr Bent, one of the new characters, is poor stuff. It's built up throughout the book and then revealed in a very weak punchline at the end. Vetinari disappointingly is present through much of the book when before he would have a couple of pages at the beginning and a couple at the end. His menace and mystique goes from interesting and dark to being that of a stern headmaster who is nonetheless approachable. Also, there isn't much satire here. What exactly is he lampooning? Pratchett's always very sharp on his targets in Discworld but there doesn't seem to be a target here except that he wanted to introduce paper money to the citizens of Ankh Morpork which, really, he could have mentioned in a throwaway line in a better Discworld book ("What's this paper money for? Where's the gold?" "Y'know that Lipwig fellow? Vetinari put him in charge of the banks, so that's what we've got now" "Oh"). Who'd have thought it with Pratchett's ingenuinty - a by-the-numbers Discworld book? And it's hinted at the end that Moist will reappear to re-do the Ankh Morpork tax system! Dear me, I sincerely hope that book never materialises. The character of Moist was good for one book, two is stretching it, three is too much. If you liked Going Postal, you'll like this. Unless you can still actually remember Going Postal, in which case you'll probably have a weird sense of deja vu. Going Postal tried to make up for its being a basically thin and over-familiar installment of Discworld by being very well polished and very slick. Making Money rewrites Going Postal, but less well polished, and less slick, which magnifies all of the faults already present in Going Postal, adds some more, and actually makes the earlier book If you liked Going Postal, you'll like this. Unless you can still actually remember Going Postal, in which case you'll probably have a weird sense of deja vu. Going Postal tried to make up for its being a basically thin and over-familiar installment of Discworld by being very well polished and very slick. Making Money rewrites Going Postal, but less well polished, and less slick, which magnifies all of the faults already present in Going Postal, adds some more, and actually makes the earlier book look weaker in retrospect by association. It was probably the worst Discworld novel in a decade. But then again, that's praising with faint damnation. It may not be up the the heights of Pratchett's greatest hits, but it's still solidly enjoyable. For all the sigh-inducing misjudged, lazy or overwritten jokes or tired character beats, there's a moment of joy, particularly in the wonderful central section set in the Unseen University. The central character may actually be slightly better written than in his first outing. The plot, while by-numbers, does at least move along at a decent pace. Because Going Postal is often recommended as an intro to Discworld (not wholly unfairly), there will be many people for whom Making Money is their second Pratchett... and that's not terrible. While it's safe and comfortable, that probably makes it a more accessible, less divisive early read than some of the actual early Discworld novels, and the tropes that have become too familiar for hardened fans may still be fresh for the newcomer, or for the casual reader who hasn't read nearly 40 of these things by now. It is by no means the worst of the Discworld novels, and is an entertaining light read. It's just... well, it's not exactly a good book. It's not a bad book either. It's an OK book, if you like this sort of thing (and fortunately, lots of us do). It's... Not Bad. Another Discworld book. These are now so familiar and comfortable, like a well worn pair of slippers or a battered old leather armchair. I confess that the plots are a little formulaic, and there is an element of repetition, but these books are done so well. The Discworld multiverse is coherent and consistant within its own logic, and the level of detail is superb. 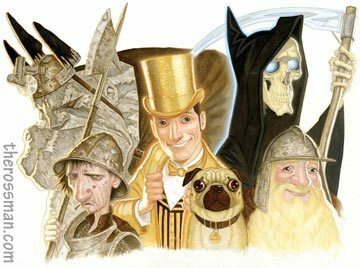 Pratchett's books ooze wit and repartee from every page, and to me his work bears comparison with the traditional standard bearers o Another Discworld book. These are now so familiar and comfortable, like a well worn pair of slippers or a battered old leather armchair. Another enjoyable romp in the Discworld universe this time following up with Moist Von Lipwig and his escapades in Going Postal. To date Moist has to be my favourite character in the limited amount of Discworlds I have read and still retains the award for worst named character ever (no official award has been produced to my knowledge). In the previous outing Moist took on the troubles of the Post Office, this time he takes on the issues with the banks. The usual dry and humorous observations are planted throughout which will raise a smile at the similarities to our own world but there are enough fantastical elements to make it a unique enough experience. Whilst you could label this fantasy it could easily be put under the bracket of satirical too. Moist is the same character as in the previous novel in that he is a complete outsider thrust into a position of authority with no previous knowledge. This leads to some of the funnier moments as it is his questioning of some of the institutional thinking that is so inherently in place that people just do it rather than knowing why they are doing that really hit home and were easily identifiable with most of the places I have worked (and no doubt the majority of the readers!). If you’re new to the Discworld series then this isn’t a book to start with. It could be read as a standalone but you would miss out on some of the hints to the previous novel. I’ve only read a handful and I definitely felt the experience would have improved with some more information on characters cropping up. Moist is a great character and there are plenty of funny parts and some great side characters to keep things moving along nicely. So whilst a book about banking might not get you salivating with anticipation, this is definitely worth your time. There are two ways I can review this book. The first is to talk about the book. The second is to talk about me. It's probably fairer to actually review the book first. 'Making Money' is one of the more recent books by the much esteemed and highly prolific Terry Pratchett, for whom everyone prays (even if they aren't the praying sort) that he staves off his senility long enough to crank out another 30 or 40 novels. Pratchett has a bit of something for almost everyone's taste and is one of the auth There are two ways I can review this book. The first is to talk about the book. The second is to talk about me. 'Making Money' is one of the more recent books by the much esteemed and highly prolific Terry Pratchett, for whom everyone prays (even if they aren't the praying sort) that he staves off his senility long enough to crank out another 30 or 40 novels. Pratchett has a bit of something for almost everyone's taste and is one of the author's I turn to when I want to read but don't really feel like reading. I do this because his novels are just so fun. 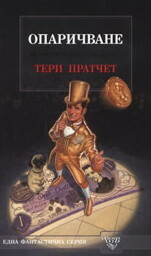 'Making Money' is one of Pratchett's Discworld novels, set in the city of Anhk-Morpork with its attendant cast of characters, and the second featuring one of Pratchett's more recent protagonists - the con-artist with a heart of gold, Moist Von Lipwig. All of Pratchett's novels are subversively didactic, and of Pratchett's protagonists, Moist Von Lipwig is probably the least subversive vehicle for Pratchett's attempts to educate the reader. In this story, the topic of Pratchett's humorously inventive lecture in novel form is primarily economics. ‘Making Money’ has all of Pratchett’s usual sly turns of phrase and plenty of humor, but it suffers from Pratchett’s usual unevenness. Sometimes he’s very very good: one of the best. At other times, he doesn’t quite get it all to come together and the jokes fall a little flat. In this case, he’s better than his worst but nowhere near his best. The occasional flatness of the humor isn’t the worst problem though. The central problem of the story is that it takes far too long for our protagonist to encounter significant difficulty, and once obstacles are placed in front of him they prove insufficiently daunting in appearance and too easily surmounted in fact. Also, the subplots of the story are not nearly as interesting as they are in other Pratchett novels, and generally the story simply fails to be as good as its predecessor ‘Going Postal’. Most of all, the various threads of the story simply don’t come together as neatly and perfectly as we would desire in a story like this. True, Pratchett ties it all together toward the end and resolves all of his loose ends, but the resulting package is not very neat nonetheless nor does the ending give an fully satisfying structure to the basically random events that led up to it. The reader is left wanting something, or at least I was. Still, it’s an enjoyable read on a cold afternoon under a blanket with a cup of hot tea near at hand. That is my review of the book, informed by my impressions but without really intruding into the review that much. What follows is a review of myself reading the book. I think a lot. My thoughts just keep going and going and there is little I can do to stop them. Lately, my thoughts have been rather dampening my ability to enjoy fiction. The catalyst for this has been in part Goodreads. I can’t blame everything on Goodreads, as the rest of the internet and my relationship to it bears a portion of the blame, but it is Goodreads that bears most closely on my relationship to books and which most resulted in prompting this particular train of thought because it most exposed me to other people saying why it was that they liked books. And the results of learning why people liked books have been rather horrifying to me, and have caused me to look at fiction with a general disgust that is not easily brushed off. I can safely say that over the past year I’ve read less fiction than in any other year since I learned to read. Pratchett is particularly well suited to illustrating the problem precisely because as I said, he offers a little something for everyone. To understand the problem, it’s important to note that my favorite books are J.R.R. Tolkien’s ‘The Lord of the Rings’ and Gene Wolfe’s ‘Book of the New Sun’. Both authors I came upon something by accident - Tolkien in elementary school and Wolfe in college - without particularly seeking them out and without knowing anything particular about them. At Goodreads as I read various people expounding on why they liked this book or that book, I noticed that the general pattern was that people liked books primarily because the books confirmed or validated for them something that they already dearly believed or liked to believe, about themselves, or the world, or other people. This could be in the form of some escapist fantasy in the case of a ‘lighter’ work of literature, or it could be in the form of some sort of philosophical or political point made cleverly or bluntly, openly or covertly. What I discovered essentially was that people liked books, and in particular gave to books the label of ‘literature’, because they liked to be lied to. They liked to have complex problems simplified. They liked to have straw men representatives of things that they didn’t like held up to be mocked or defeated. They liked to have their opinions validated. They liked to have the truth simplified and dumbed down. They liked to believe that one single story reflected artfully in some broken mirror shard told them everything that they needed to know about the real world. That is what entertained them. And it didn’t seem to matter how intelligent the person was. In fact, if anything, the more intelligent the reviewer seemed, the more prone they seemed to this behavior. The less intellectual the reviewer and the less they seemed to think about what they read, the less prone to liking something for this reason that they seemed. Although, it often didn’t seem to matter because the less intellectual reviewers always seemed to find what they wanted to find in the story when they reviewed it at length even if it wasn’t actually there. Or to put it even more plainly, nothing objectively separates the reading of works of literature from listening to that preeminent entertainer of our day Rush Limbaugh. For those of you that would rather gag on a pile of maggots than listen to Rush, he has always been very open about the fact that he is not a journalist but an entertainer. And he has always been very open about the fact that he succeeds at entertaining people and garnering listeners because he validates for his listeners in ways that they find artful and compelling what they have always believed anyway. Like Moist Von Lipwig, he has the gift of being able to show the trick to his audience and still get away with it. I’ve always found that Rush is a far smarter individual than his critics give credit for. It may be that he’s a complete hypocrite or that he’s wrong about everything, but he is no fool. I have lately come to the conclusion that Rush’s observation about why he succeeds in talk radio probably applies to all forms of artistic expression generally. We like what caters to us. And that’s all. Nothing more. Everything else seems very likely to me at this point to be rationalization and covering up for ourselves so as to claim that our opinions as to the value of art are objective facts – this is good and that is bad. Or, since ‘good’ and ‘bad’ are not words academia is fond of, we find some more nuanced way of saying exactly the same thing. When we speak of reading we often use the metaphor of eating. When we read a book we devour it with or mind; we drink it in. We digest its contents. Well, I find it not terribly surprising on reflection that the things which I find agreeable are those things which agree with me. Pratchett is an excellent case in point. Amongst my friends of a particular political and philosophical bent, their favorites tend to be precisely the ones where Pratchett’s bit of didacticism most agrees with their own. These of course I found the least interesting, least readable, with the least empathetic characters, least amusing humor, and least satisfying twists. On the other hand, my favorites were stories like ‘The Night Watch’ and ‘Wee Free Men’. These I found to have the most empathetic characters, the most exiciting endings, the most amusing humor, and to be the most compelling reading. Of course, the stories I liked best were also some of the stories where Pratchett’s Libertarian, scientific, and nerdy inclinations most clearly intersected my own. So in fact, I find myself unable to state that they were better written or better conceived stories than the ones I didn’t like. Perhaps I find Pratchett’s writing ‘uneven’ solely because he and I are both highly eclectic individuals with diverse tastes, and all I was really critiquing was how closely he tacked to what I believed. Like Homer Simpson, do I find it funny only when I find it to be true? I find the whole idea I've constructed here repellent. It causes me to question whether there is any real value in fiction at all. I don't like it, but I also don't see any evidence that it isn't true. This is the first Discworld book I have read. And, I know, I know, I shouldn't have started here, this is the second part of a Trilogy that assumes I know the characters background, etc etc etc. But f**k it, this is where I decided to start. I already knew lots of stuff from this series cause I have friends who LOVE Discworld and they have been taking to me about this for ages. So, when I got to this books, I already had some background on the world, and, let's be honest, the knowledge I needed to This is the first Discworld book I have read. And, I know, I know, I shouldn't have started here, this is the second part of a Trilogy that assumes I know the characters background, etc etc etc. But f**k it, this is where I decided to start. So, when I got to this books, I already had some background on the world, and, let's be honest, the knowledge I needed to understand this book is not that big of a deal, any decent reader with some working brain cells can connect the dots after a while. But let's talk about the interesting part...the book. I'm just gonna say this... I LOVED EVERY SINGLE PART OF THIS BOOK. There it is. This is perfection, pure perfection. It's a fantasy, comedy that has elements from a very broad amount of genres, has an incredibly original story, with amazing and very well crafted characters, has some unexpected twists and a plot that really keeps you reading nonstop. Pratchett knew how to write. As simple as that. Anyway, what I said below still goes, except for the final sentence, since now we know we got Raising Steam instead of the implied book about reforming the Ankh-Morpork tax system. I've only read that one once, which probably says something about how I liked it. Exceptional later Discworld. Lots of interesting plot, fun characters and humourous asides; he really takes the characters created for Going Postal and runs with them, developing them much more rapidly than he did with other recurring characters, giving the impression that Moist leapt in to his fertile imagination fully formed and raring to help The Disc evolve. There is a saying that you can only tell the truth through fiction and it seems that Terry Pratchett is a believer of that saying. An ex-con is blackmailed into becoming the head of the Ank-Morpork's bank and is actually very good at it. Funny, mischievious and witty this book critisizes the modern world of the recession and the banking dominance. With the Post Office running as smoothly as possible and facing plain paperwork ever The financial sector of Ankh-Morpork is dire trouble and Lord Vetinari looks to his Postmaster General to solve the problem, however he doesn’t want the opportunity but somethings are out of his hands. Making Money is Terry Pratchett’s 36th Discworld novel and the second to follow the conman-turned-civil servant Moist von Lipwig who is beginning to pine for thrills and suddenly finds himself in the midst of them. There are a lot of people who love these Discworld books, but I'm afraid I don't see the attraction. I've only read one other of them - Mort - and I thought it was pretty clever. However, this book and it's predecessor, Going Postal, are the only two of the 38 book series nominated for the Nebula award. So I would have expected them to be the best, but I just don't see it. One problem is probably that I have not read Going Postal, and a portion of the humor in this book is really just reminders There are a lot of people who love these Discworld books, but I'm afraid I don't see the attraction. I've only read one other of them - Mort - and I thought it was pretty clever. However, this book and it's predecessor, Going Postal, are the only two of the 38 book series nominated for the Nebula award. So I would have expected them to be the best, but I just don't see it. One problem is probably that I have not read Going Postal, and a portion of the humor in this book is really just reminders of past humor, as in "Hey, remember how funny it was when ... happened?" One theory I've heard is that these have been honorary career-based nominations, not justified by the current books themselves. Based just on the two I've now read, Mort and Making Money, I could agree. “Rich as plum pudding and more complicated than a dwarf contract” on describing the new design of bank notes. So descriptive and reminiscent of some family gatherings: "They got along like a bag full of cats." So endearing and makes me feel nostalgic for rural England: "that most knowledgeable of beings, the man in the pub." Inventive description, which provides us with a clear impression: "a voice like a saw encountering a nail with a slight additional touch of foghorn." 'He somersaulted happily around the floor making faces like a rubber gargoyle in a washing machine' and 'the girl could flounce better than a fat turkey on a trampoline'. What is there not to enjoy about a man that can produce amazing sentences as these? But, this story focus' on banking problems. The family that runs the main Ankmorpork Bank is doing so in a spectacularly bad way, so what is the Patrician to do but use the same man that brought order and productivity to the Post Office. As with all Pratchett books, nothing is straight forward and the characters think themselves into an array of funny situations and use ingenuous methods to solve them. There are clowns, dogs, assassins, igors, golems and (my favourite) CMOT Dibbler to enhance the story and keep you laughing for hours. Edit 10/mumble: I finished this a while ago. After reading some earlier Pratchett recently, this shone like a very shiny literary thing. Massively enjoyable. Unfortunately, since it's been a couple weeks since I finished it, I can't give a detailed review. It lived up to my expectations, though, which is always appreciated. Edit 10/05: Got it today from the library. Mwah ha ha. OLD: Technically I'm not reading this, but I'm first on the holding list for the library, and the librarian currently rea Edit 10/mumble: I finished this a while ago. After reading some earlier Pratchett recently, this shone like a very shiny literary thing. Massively enjoyable. Unfortunately, since it's been a couple weeks since I finished it, I can't give a detailed review. It lived up to my expectations, though, which is always appreciated. I find the rating of this book difficult. On one hand, it is Discworld, and Discworld is just always awesomest! On the other hand, I liked it less than many other Discworld-novels. It felt a little like there had to be thought of something to keep Moist going, and the bank was as good as the rest. Still, I loved the side-characters, it was great to meet Vetinari and Vimes again! Another day - another excellent Discworld book. “People don't like change. But make the Another day - another excellent Discworld book. “But what's worth more than gold?" “Building a temple didn't mean you believed in gods, it just meant you believed in architecture. Klasicky zábavná a oddechová kniha ze série Zeměplochy, tentokrát o Vlahošovi von Rosretovi, který se snaží rozpohybovat zkostnatělou Ankh-Morporskou banku. Oproti sérii s Hlídkou či Čarodějkami slabší, ale stále dobrá. Vetinari, golemové a hlídka included! Auch wenn Schöne Scheine schon von der Figurenkonstellation und der Gesellschaftskritik frappante Ähnlichkeit mit "Ab die Post" aufweist, hat es mir trotzdem bei weitem nicht so gut gefallen. Dies kann zwar daran liegen, dass ich mich in der Telekom Branche viel eher zu Hause fühle als im Bankwesen, ich glaube aber nicht, dass es daran liegt, schliesslich habe ich Betriebswirtschaft und VWL studiert und mir ist das Metier gar nicht fremd. So verstehe ich die Anspielungen auf Geldwirtschaft, Infl Auch wenn Schöne Scheine schon von der Figurenkonstellation und der Gesellschaftskritik frappante Ähnlichkeit mit "Ab die Post" aufweist, hat es mir trotzdem bei weitem nicht so gut gefallen. Dies kann zwar daran liegen, dass ich mich in der Telekom Branche viel eher zu Hause fühle als im Bankwesen, ich glaube aber nicht, dass es daran liegt, schliesslich habe ich Betriebswirtschaft und VWL studiert und mir ist das Metier gar nicht fremd. So verstehe ich die Anspielungen auf Geldwirtschaft, Inflation, Einlagensicherung und System von Bretton Woods sehr genau, aber der Roman ist einfach nicht so bösartig und witzig wie die Angriffe von Pratchett auf das Internet und die Telekommunikationsindustrie. Dabei hätten die Banken, weit mehr Angriffsfläche und -potenzial geboten, wenn man den Aktienhandel und die Derivate, die heutigen zockenden Börsenhändler, die Pensionsfonds... discworldisch auf die Schippe genommen hätte. Dies bleibt uns der Autor aber leider schuldig, es geht bedauerlicherweise um die klassische Bank von vor Jahren, deren Haupt-Funktion heutzutge eigentlich kaum mehr aktuell ist. Da hat Pratchett wirklich eine Chance vorbeistreichen lassen. Ein paar gute Ideen vor allem im volkswirtschaftlichen Bereich sind trotzdem drinnen. Den Blupper ein wirklichkeitsgetreues Mini-Modell der Wirtschaft in Röhrchen und Blasen hätte jeder VWL Professor gerne. Die Golems, die für die Verarmung ganzer Völker verantwortlich sein würden, sind auch perfekte Analogie jedes Makroökonomischen Modells. The return of Moist von Lipwig. spoiler warning for Going Postal. The post office is running merrily alone -- Moist has even had to testified against a forger who made stamps -- and Moist's fiancee Adora Belle Dearheart is out doing something for the Golem Trust. And someone is trying to break into the Post Office building. Turns out it's Moist, who is bored. Well, the Patrician has a job offer -- running the mint -- and Moist declines, most decidedly, but alas, he has come to the attention of the The return of Moist von Lipwig. spoiler warning for Going Postal. Well, the Patrician has a job offer -- running the mint -- and Moist declines, most decidedly, but alas, he has come to the attention of the chairman, a very old widow. She sees through him at once, and makes her dog her heir, and then leaves the dog to him. He has no choice.